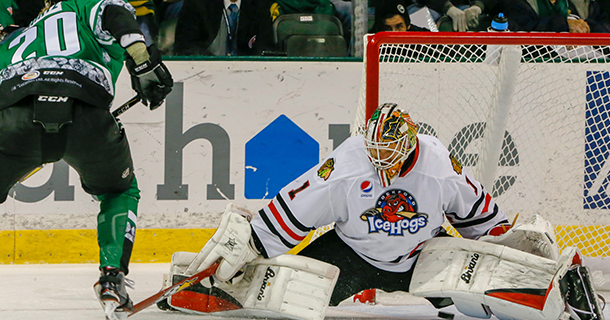 The Rockford IceHogs are sitting in San Antonio with plenty to think about. Chicago’s AHL affiliate has its second game in four days against the Rampage coming up Tuesday night. 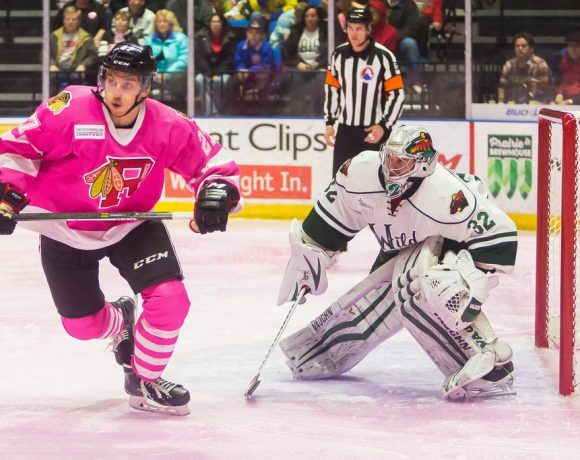 Rockford will be attempting to snap a three-game skid, its longest of the young season. It wasn’t a particularly memorable weekend for the piglets. After dropping a 3-1 decision to Grand Rapids Wednesday morning, Rockford flew down to Texas and were dominated in a 5-1 loss to the Stars. The following evening, the offensively-challenged Rampage beat the Hogs 2-1. With the recent setbacks, Rockford is now 8-7-1-2 on the season. That .528 points percentage is good for sixth place in the Central Division. In three games, the IceHogs scored three goals. They were 1-14 on the power play. The weekend did not produce a lot of offense in the way of shots, either. Rockford recorded just 16 shots on goal against Texas, then followed that up with a 15-shot performance in San Antonio. To be fair, the IceHogs were missing some players. However, Rockford got solid goal-tending that had them even with its Lone Star opponents through 40 minutes on both Friday and Saturday. Texas out shot the Hogs 14-2 in the third period to pull away; Rockford mustered six third-period shots against the Rampage. Jordan Schroeder got back into the lineup after missing nine games, finding the twine in his return Friday night. Tyler Sikura missed his third and fourth games with an illness. Anton Forsberg stayed home to recover from a similar illness. The organization got some bad news this week. Matthew Highmore, who injured his shoulder October 28 in a fall at the BMO Harris Bank Center against Manitoba, will be out for the next four to six months following surgery last Wednesday. Highmore had seven points (3 G, 4 A) in eight games before leaving that game in the second period. He is one of the Hogs young prospects who can make things happen around the net, so his game is going to be missed. Derek King is hoping to get the ship righted starting Tuesday in San Antonio. Here are some of his observations during the losing streak. The Stars, who pressured Collin Delia all evening, broke open a tie game in the third period with four goals. The Hogs goalie kept out 26 of 27 shots in the first 40 minutes before the dam broke. Texas opened the scoring 6:25 into the contest while the teams were skating four to a side. Denis Gurianov swiped the puck from Rockford defenseman Darren Raddysh just inside the Stars blue line. Gurianov led an odd man rush the other way, setting up Roope Hintz for the score. Despite being out shot 27-14 in the first 40 minutes, the IceHogs pulled even late in the second period. Viktor Ejdsell had thrown a shot attempt wide of the Texas net. Dylan Sikura chased it down behind the cage, passing to Jordan Schroeder as Sikura came around the end boards. Schroeder, making his return to action after missing nine games, tied the game from the right post at 18:44 of the middle frame. If the Stars had dominated the game everywhere but on the scoreboard in the first two periods, they remedied that expeditiously in the final twenty minutes. While Texas captain Travis Morin screened Joni Tuulola, Tyler Fedun drew twine on a long-distance wrist shot fifteen seconds into the third period for a 2-1 advantage. Rockford mustered just two shots to the Stars 14 in the third period. Texas got a goal from Morin at the midway point of the frame, then another from Samuel Lebarge 37 seconds later. Colton Hargrove’s exclamation point on the rout came 15:25 into the period. For the game, the IceHogs were out shot 41-16. The relentless offensive pressure was too much for Delia in the final period but he still made 36 saves in the contest. 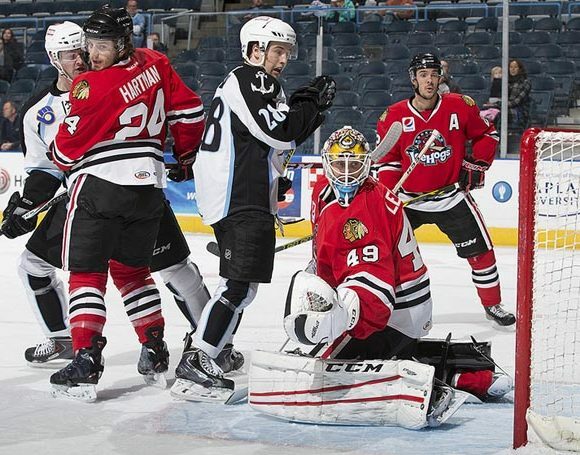 The IceHogs were out of sorts against the AHL’s worst team, dropping their third straight game despite a solid effort by Kevin Lankinen in goal. The rookie, returning from a spell with the Indy Fuel, stopped 19 of 21 shots but didn’t get the support he needed at the other end of the ice. Rockford experienced a bevy of issues in getting pucks to Rampage goalie Jordan Binnington. Two early power plays yielded nothing in the way of shots, and the two teams spent most of the opening period throwing the puck to each other or chasing it around the ice. San Antonio took a 1-0 lead at the 14:35 mark of the second period after Graham Knott was called for holding. Austin Poganski knocked a loose puck under the pads of Lankinen to put the Rampage on top. The Hogs came up with an answer a few minutes later, also while on the man advantage. Carl Dahlstom fielded a pass from Anthony Louis and sent a shot from the point that snaked past Binnington. Justin Auger provided cover from the front of the crease and Rockford tied the game at 18:05. The Rampage took advantage of a neutral ice turnover midway through the third period to regain the lead. Adam Musil beat Lankinen from the slot at 9:07, assisted by Tanner Kaspick and Joey LaLeggia. Musil’s goal held up; the IceHogs could muster only 15 goals on the evening. Lankinen was brought to the bench for a sixth skater, but Rockford was unable to utilize the additional manpower and the clock ran out on the Hogs. Rockford gets a second shot at the Rampage Tuesday night before a brief return to the BMO Friday. The Hogs host the Chicago Wolves on Hockey Fights Cancer Night in the first tilt of a three-game weekend. 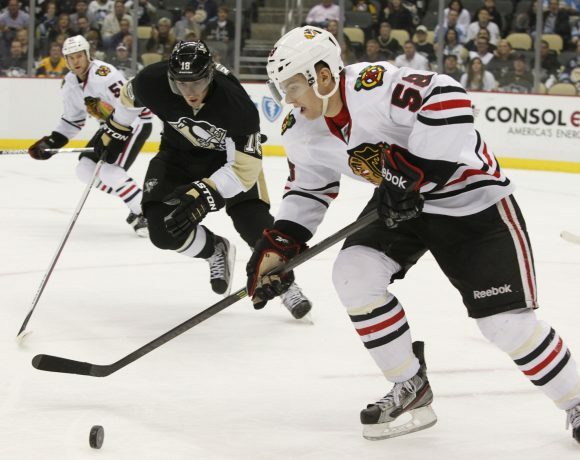 Rockford visits Milwaukee Saturday night and Chicago Sunday afternoon. Follow me @JonFromi on twitter for my thoughts on the IceHogs all season long.